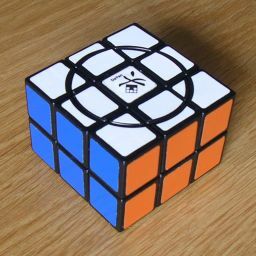 Crazy 2×3×3 is similar to a Rubik's Domino, in that it is a 2×3×3 cuboid, but the two square faces also have a circular cut going through all 8 pieces around the centre. Apart from the usual centre facelet, there are therefore 8 more centre facelets on each face. Whenever you twist the top or bottom layer, all the centre pieces either move in unison with the turning layer or all stay stationary with the non moving layer. You can therefore consider each centre facelet to be two layers thick, connected to the corresponding one in the other layer. Also, one of the corner pieces is in fact connected to the adjacent centre piece. The centres always move in unison with the layer containing that corner. The mechanism also allows for one type of move that is not possible on a normal Domino. If you twist the middle layer a quarter turn, then you can surprisingly twist the top layer a half turn. Such a move allows it to be mixed further than with normal moves, as it breaks a parity restriction and allows the centre pieces in one layer to move independently of those on the other layer. There are therefore 26·7!·8! = 13,005,619,200 positions. If you allow this special move described above, then the edge and corner centre facelets can move independently, though they are restricted to four orbits, each with two white and two yellow pieces. This gives 4!/(2!2!) = 6 possibilities for each orbit, except that the orbit of corner centres containing the fixed corner is fully determined by the position of the other four corner centers. This gives a total of 63·2·7!·8! = 87,787,929,600 positions. The standard notation for the Domino will be used. The letters F, B, R, and L denote half turns of the Front, Back, Right, and Left sides. A clockwise quarter turn of the top layer is denoted by U, a half turn by U2, and an anti-clockwise quarter turn by U'. 1. Moving the middle slice between the R and L layer upwards and away from you for one quarter turn. 2. Doing U2. This move swaps 2 edge blocks of the middle layer, and it may or may not swap the face centres, too. 3. Move the middle layer down again. Phase 1: Pair up the centres. If the puzzle has been mixed using only normal moves, this phase will not be needed. If the corner centres are not paired (i.e. if each piece is opposite one of the same colour in the other layer), then do the special move combo S.
If the corner centres in the top face don't all have the same colour, turn a side to make it so. If there are unpaired edge centres (i.e. if there is an edge centre opposite one of the same colour in the other layer) then hold one of those edges on the right hand side and do the special move combo S. If there are any further unpaired edge centres, repeat this step. Phase 2: Solve the outer pieces. Solve the outer pieces exactly like a normal Domino. Phase 3: Solve the centres. If a pair of corner centres has to be flipped, hold the puzzles with that pair on the right, and do R U2 F U2 R U2 F U2. Note that depending on where the fixed corner piece is this may disturb some edge centres. 1. Hold the puzzle with the flipped edge centres at the front. 2. If exactly one of the left and right edge centres is flipped (i.e. they are different colours) then do F R F.
3. Do S U2 S U2 S U2 to flip the front edge centre. 4. If you did the moves in step 2, do them again here: F R F.
Repeat all this for each flipped edge centre. Note that depending on where the fixed corner piece is this may disturb the middle face centre. If the middle face centre is flipped, then do RL U2 RL F RL B U2. If you mixed the puzzle without using the special move, you might want to solve it without using that move too. Here are some alternative edge centre flip move sequences that can help you with that in phase 3. These sequences work regardless of where the fixed corner lies.